On May 26th, innovative robotics has officially peaked when the first robot baby was introduced at a Campus Party. A team of innovative robotics experts located in Amsterdam aimed to create a robot baby using a method similar to sexual reproduction. Although the process is extremely complex, it is easily comprehensible to the average person. The mechanism must include two robots present in the same arena in which they will live, work and reproduce. The arena contains two sources of red light that is responsible for motivating the robots towards them. Once they have made their way and are now joined near the sources of red light, then reproduction can be made possible. At this location, the robots evaluate one another in order to determine whether procreation will occur. If a positive mutual response is communicated amongst the two apparatuses, then individually, they will send their genomes through the wifi network. 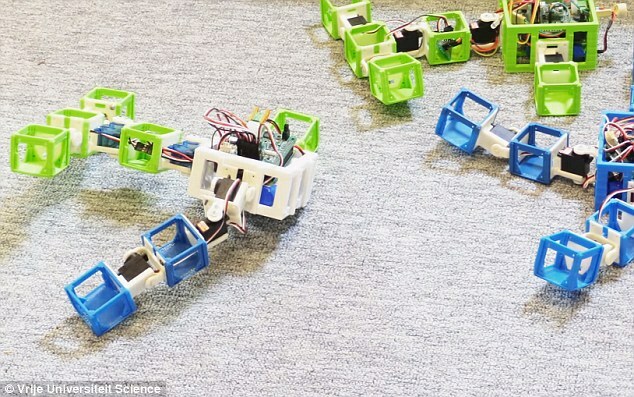 Similarly to animal reproduction, the genomes sent through the network are combined in a random sequence in order to determine the software and hardware of the robotic offspring. When the genome is finalized, the complex sequence is transmitted to a 3D printer which will then execute the instructions. The end result is a fully functioning robot created from the genomes of its two receiving parents. After “birth”, the baby apparatus follows a strict learning process, which will then allow for it to develop into an adult and hopefully into a parent as well. Researchers believe that the robots, like humans, will follow one of the great phenomenons of the world, evolution! Because of this, the mechanical computers will be able to develop its bodies and obtain a greater fitness as the generations pass. The effects of innovative robotics can have a great impact on the scientific society. As a result of robot baby, experts essentially suppose that this method can be useful for the colonization of Mars. To learn more about innovative robotics, click here.